There is something about taking a hike and being in nature that just automatically brings peace and calm to my mind and spirit. And, let’s be honest, with young kids at home, I need all the inner peace I can get! But I have often wondered if my children would enjoy the woods as much as me, which led to the question: what is the best way to hike with kids? While every child is different, there are some basic guidelines that I have found to work most of the time. In this article, I’ll lay it all out for you to make sure that you and your little ones have a great time making memories in nature. Let’s get started! Perhaps before you had children and would go hiking, you wouldn’t be satisfied until you had covered 10-15 miles in a day. Well, let me tell you right now, you can throw that number out the window because of it plain and simple is not going to happen. Depending on the age of your child/ children, you won’t be able to go too far into the wilderness with them, even if you want to. Their little bodies simply can’t handle the same amount of walking that yours can, and if you push them too far beyond their energy limits what should be a fun family outing will quickly turn into the perfect storm of whining and temper tantrums. If you’re not careful with how far you take them, you might turn them off from hiking altogether. Something else to take into account is the fact that even if an area of the forest doesn’t seem all that interesting to you, it is a wonderland of new experiences for your children. Let them stop and smell the roses. When I first took my son out, he was only two years old. We went for a hike next to a stream and only went about 300 yards into the woods. We spent most of the time throwing a rock into the water, picking up sticks, and looking under logs for salamanders and snakes. He had a blast, and it didn’t matter that we only went a little ways into the woods, he was hooked! Like most things with little kids, you have to build up their endurance and experience. You also have to understand your child. If they can hack it for a bit of a longer hike, then, by all means, take them a bit further. However, let them dictate the pace. Don’t try and rush them. Although, if you have a younger child like an infant or toddler, feel free to carry them along as you hike. 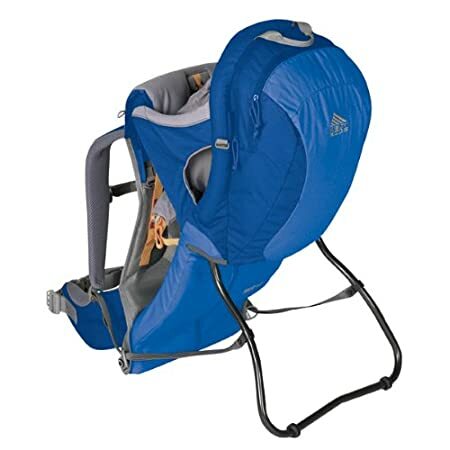 There are tons of great options out there for backpack carriers, like this one from Kelty, that will allow your little ones to tag along with you deeper into the wilderness without having to work too hard themselves. If they start to get a bit antsy in the carrier, simply take a break and let them explore the woods on their terms. Depending on where you are hiking and the weather conditions there, you might need some different items than I have listed here. These are just some good ideas to have along with you as you and your little ones explore Mother Nature. Snacks – Nothing will ruin a good time like a hungry child, and nothing will make them hungrier quicker than a walk in the woods. Be sure to have some of their favorites on hand to keep them satisfied. Water – The best time to hike with kids in the woods is the summer since you don’t need to worry about keeping them warm. You do, however, have to be sure they stay hydrated, so leave the juice box at home and bring plenty of water. Carrier (Infants And Toddlers Only) – As I said before if you intend to take a really little one into the woods, it pays to be prepared to carry them in comfort. A backpack carrier is suited perfectly for this job. The Right Footwear – While toddlers won’t need special hiking boots, you should be sure to have them in comfortable sneakers, so their feet don’t hurt them as they hike. Extra Socks – ALWAYS BRING MORE SOCKS! With all the cool puddles and mud that your littles are going to come across, it certainly isn’t fair to expect them to stay dry! Let them get wet, and then change them afterward. Comfortable Clothes – You don’t need to get any fancy clothes for your children to hike in. On the contrary, the older the clothes, the less mom will care if they come home streaked in mud and covered in leaves. 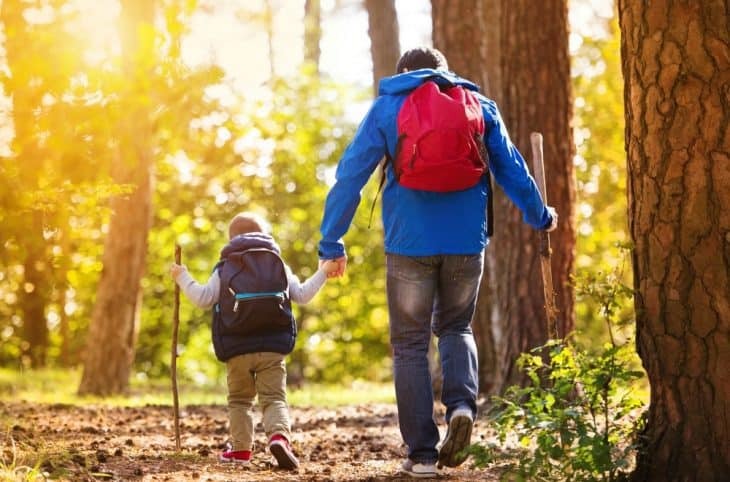 If you follow these basic guidelines on the best way to hike with kids, you’ll be sure to have a great time in the great outdoors. If you have any questions, comments, or further suggestions for how to go hiking with young children, please let me know in the comments section below. Have a great day! Hello! My name is Johnny and I’ve got one of the greatest jobs on the planet…I’m a dad! I am the father of two rambunctious boys and one lovely little lady.Ever since I was young myself, I have always wanted children of my own so that I could help them to explore this big beautiful world of ours. I’m so happy that you have chosen to join me on this journey, and can’t wait to see where it leads us!